Make yourself at home in one of the 53 air-conditioned rooms featuring fireplaces and flat-screen televisions. 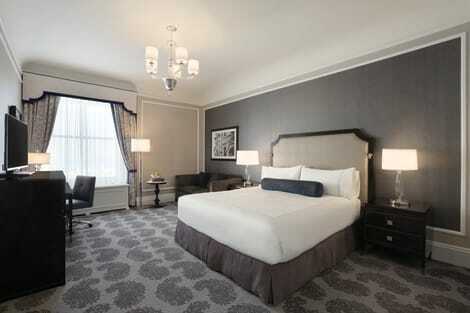 Your pillowtop bed comes with Frette Italian sheets, and all rooms are furnished with sofa beds. Kitchens are outfitted with refrigerators, ovens, and stovetops. Satellite programming and iPod docking stations are provided for your entertainment, while complimentary wireless Internet access keeps you connected. Fairmont San Francisco presents an awe-inspiring picture of historic San Francisco. The grandeur of the hotel coupled with its reputation for impeccable service promises a truly memorable experience for guests. Centrally located atop Nob Hill, Fairmont is a short cable car trip from the bustling Downtown, Financial District, Union Square and Fisherman's Wharf.In fact, it is the only spot in San Francisco where each of the City's cable car lines meet. 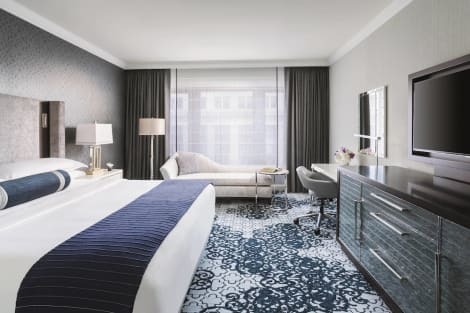 Each of the hotel's spacious guestrooms and suites have been elegantly updated including flat screen TVs, luxury linen ensembles & pillow top beds. Fairmont San Francisco offers three fabulous dining options during your visit to the hotel. The Tonga Room & Hurricane Bar offers exotic Asian cuisine, along with the City's best Mai Tai, in the unforgettable setting of a tropical rainforest. Laurel Court Restaurant & Bar offers a true San Francisco fine dining experience featuring fresh local ingredients paired with one-of-a-kind wines from the area';s top boutique wineries.Inspired by the cafes of Europe, Caffe Cento combines the coffee of illy, with the chocolate of Ghirardelli and the hospitality of Fairmont.In addition to specialty coffees, Caffe Cento also offers a selection of teas, fresh pastries, breakfast and lunch items.